Former Attorney General Eric Holder told a group of liberal lawyers to keep fighting at a San Francisco fundraiser Wednesday, continuing his message about using state power to oppose the Trump administration. Holder, who served during the Obama administration, told his audience not to be afraid of what President Donald Trump is doing, but he still affirmed that news from the White House is "disturbing," the San Francisco Chronicle reports. He also said that he worries about the "moral arc of the universe" bending away from justice , not toward it as Martin Luther King Jr. said. "It's the responsibility of all of us to keep our hands on that arc," he said. "There is fighting to be done, there are lawsuits to be brought … You can never underestimate the power of the American people." The fundraiser was for Legal Aid At Work, a nonprofit advocating for low-income workers, and the Chronicle called it a "gathering of about 800 decidedly liberal lawyers." 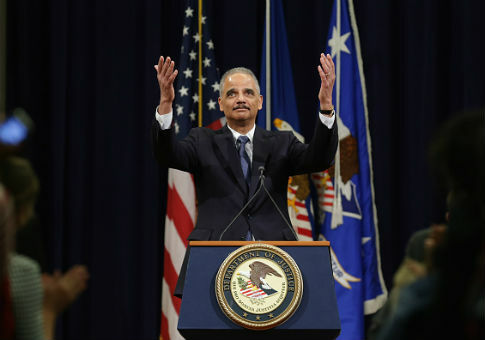 Holder granted that many had reason to worry but cautioned against it. "You can't just curl up in a fetal position," he said. Holder has raised his profile as a leader of the "resistance" to Trump by working with state governments on how to oppose his administration. He and his Washington, D.C., law firm Covington & Burling are currently being paid to serve as outside counsel to California's state senate, and he has used that as an opportunity to promote a progressive agenda. "California is in so many ways a trendsetter, whether it is in pop culture or in politics," Holder said in June about its "sanctuary state" bill. "That's why it was such an attractive possibility for me to go to California and work with the legislators there in crafting their response to the Trump administration—because I think what California does gives courage to other states and other public officials in other parts of the country who might be thinking about principled opposition." Pamela Karlan, a law professor at Stanford, asked about the similarities between the Russia investigation and Watergate, and Holder affirmed that there were "disturbing echoes." He also said that the paradigm of the federal government working for justice against states' prejudices had been reversed since the Civil Rights era. "The worst words that could ever come off somebody's lips were ‘states rights,'" Holder said about the Civil Rights Movement. Now, however, he said that oppression was coming from the federal government because of Republicans. "What we're talking about now in California … is an effort not to go back," Holder said. The Obama Justice Department that Holder led pursued a progressive agenda at the federal level. He left in 2014 with his approval rating sagging at 26 percent. This entry was posted in Politics and tagged California, Eric Holder, Justice Department, Trump Administration. Bookmark the permalink.